If there’s one thing I’ve learned in my culinary adventures, it’s this…. Food should be real. This is your body and the last time I checked, you only get one – so love it and treat it right by nourishing it with natural and nutritious foods. Next time, read the label of your next boxed meal and let me know if you can explain what each and every ingredient is and how it’s produced. When you cook with real food, the ingredients are simple. Zucchini pasta is made out of, well, zucchini. Mashed cauliflower is made out of cauliflower, garlic, and butter. Bacon is meat from the side of a pig, but who knows what turkey bacon is? I could go on and on, but I think you get my point. 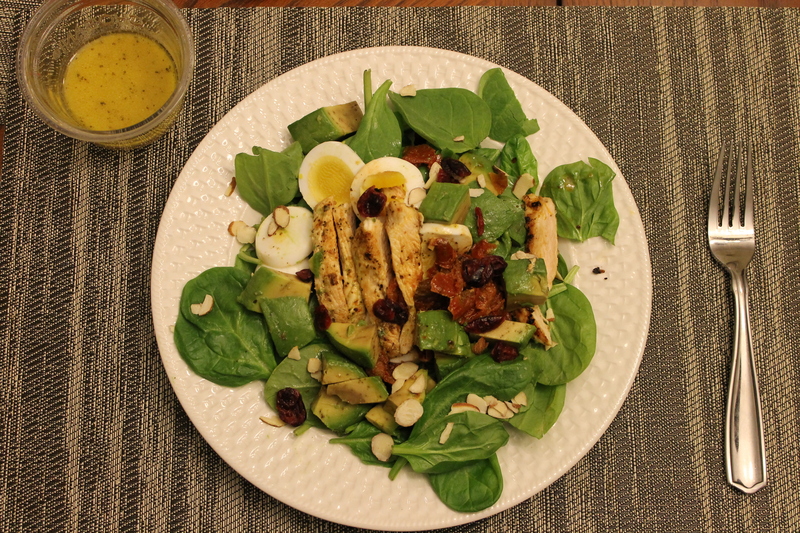 I stopped buying bottled salad dressing once I started to cook Paleo. I read the label one day of my Trader Joe’s fat-free balsamic vinaigrette and was perplexed. Vinegars (Red wine, balsamic, cider, white distilled) – fine. Water – fine. Xantham gum – what?? Caramel color – why? I’ve switched to balsamic vinegar and olive oil and have never looked back. 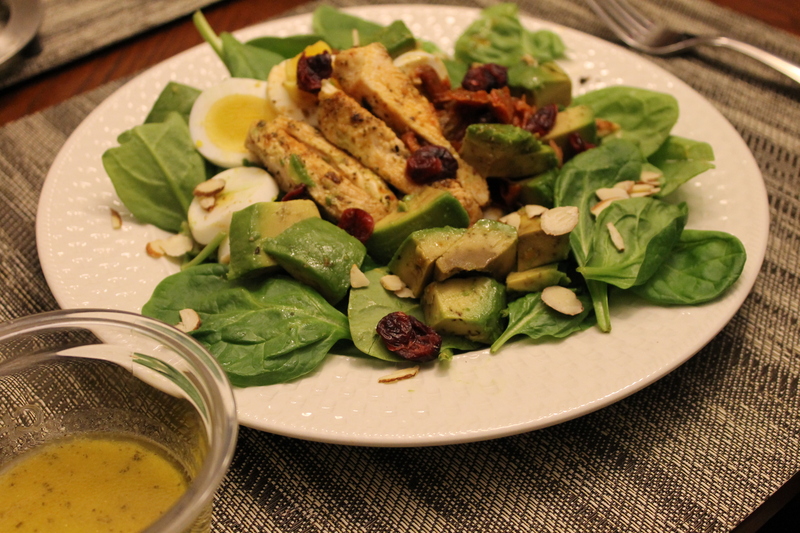 Tonight’s dinner was a simple salad with a really easy homemade dressing. Add all ingredients into a mixing bowl. Using a whisk, mix well. Adjust taste to your liking (if it is too sour, add more dijon). Store in air tight container in fridge for up to one week. I spent a whole day last weekend in the kitchen. It was amazing. I was so happy experimenting with the food that I had in my fridge and pantry. Oh, the joys of cooking! I make Paleo meals every other day, but I have been attracted to cooking dishes that feature in season ingredients are full of flavor and healthy in different ways. I’m not a vegetarian, nor do I think I will ever become one, but I made this pasta salad dish and immediately fell in love (even Bjorn enjoyed it). It features a lot of my favorite ingredients and is an easy option to pack for lunch the next day. Add pasta and remaining ingredients into a large mixing bowl. Mix well. We’ve been eating so poorly lately. I’ll usually get home around 6 or 7 during the week and am often too tired to cook. I have tons of recipe ideas buzzing in my head, but am having some trouble finding the energy to work my magic in the kitchen. I must find a new routine. We cannot continue eating like this. 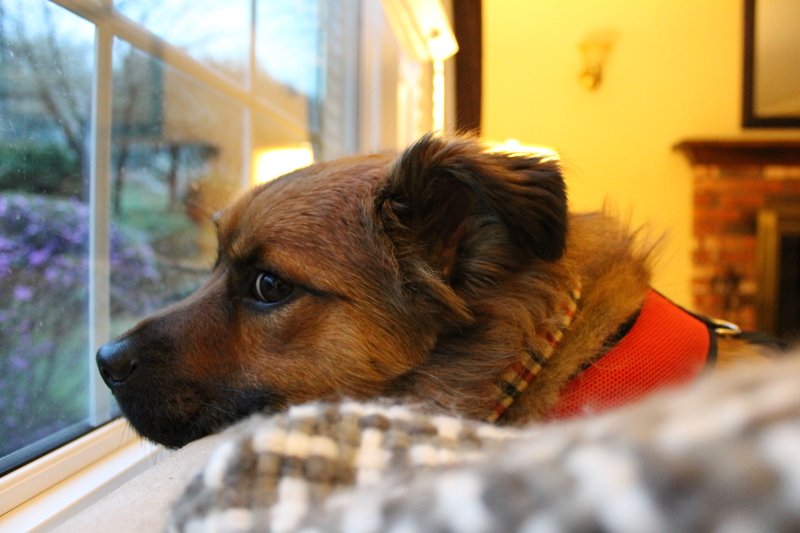 One night, I came home and Bjorn had already eaten dinner. What was his dinner? “Pizza bagels and pigs in a blanket”, hah! I always love a good salad. Good salads always require a little bit of extra effort, but it sure is worth it in the end. The mango and avocado were getting super ripe, so I knew I had to include that in my meal tonight. Since I didn’t plan ahead, I could only include seafood as my protein (easy to defrost). Turned out pretty good for a last minute dish! Took about 15 minutes from start to finish to prepare and cook. Season tilapia filet with sea salt and black pepper. Bake in oven at 350 degrees for 10 minutes, or until cooked through. Place mango, avocado, grape tomatoes, and lime juice in a bowl. Mix well. Season with sea salt and black pepper. 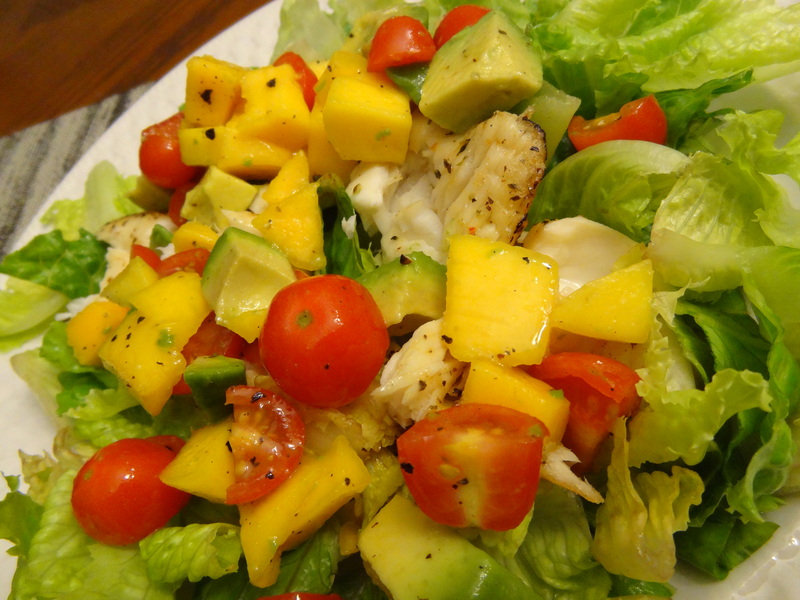 Place the chopped Romaine on a plate, top with tilapia and mango mixture. Serve immediately. Wow, it’s been awhile since I’ve posted. I’ve been cooking a lot of new dishes! But just have been lazy about posting. And lately, I’ve been really into my yoga practice; it’s so satisfying. I can’t get enough!! Too bad I can’t go everyday (yeah, work gets in the way…). One of the things that Bittman said that really resonated was something along the lines of… “What’s the main ingredient in chips? Who knows! But, we all know that the main ingredient in broccoli is… broccoli.” Let’s all take that extra step and effort in nurturing our bodies with wholesome and natural foods. In a large skillet, over medium to high heat, add olive oil and shallots to pan. Saute for 2 minutes, or until transparent. Add 2 cups of water and about 1/2 teaspoon of sea salt; bring to a boil. Add quinoa, cover, reduce heat and let simmer for 15 minutes (or until all liquid is absorbed). Remove from heat and let cool. 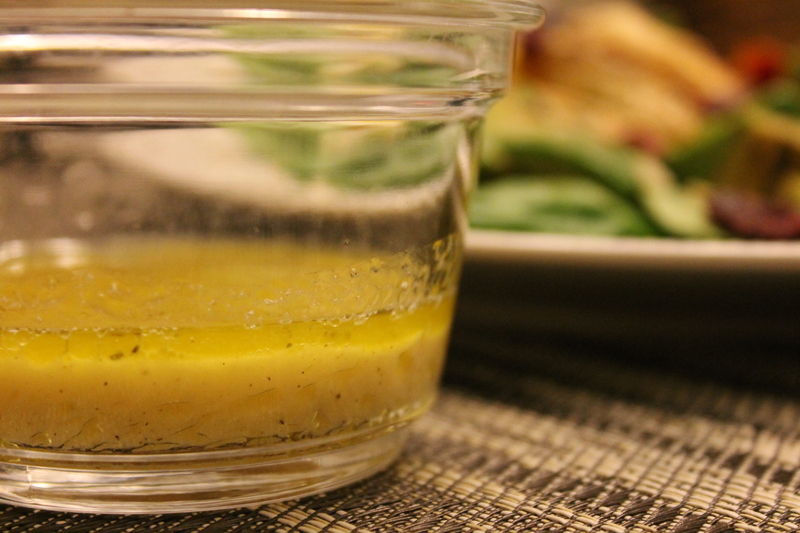 In a large mixing bowl, combine 2 tablespoons of olive oil, lemon juice, and black pepper. Mix well. 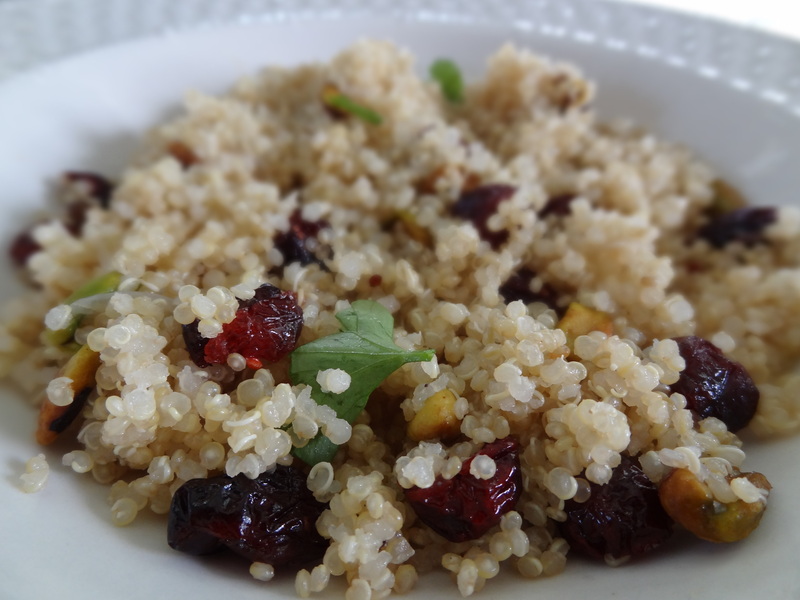 Add quinoa, dried cranberries, pistachios, and parsley. Toss gently. I made a special trip to Whole Foods this weekend. I rarely shop there; it’s just way too expensive and I don’t enjoy my experience there like I do at Trader Joe’s. I spent like $12 on a jar of whole dried cranberries (really good and juicy), 2 mineola oranges (on sale), coconut flour (the only place around that freakin’ carries this), and beautiful golden and red beets (EXCITEMENT!). 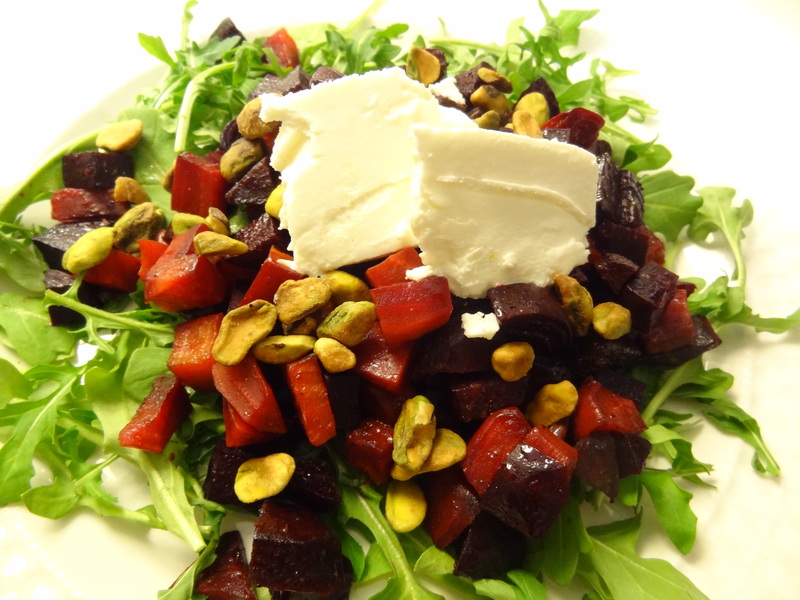 I roasted the beets in the oven and made a warm beet salad to warm the heart. Note, when preparing beets, make sure you wear gloves or your hands and fingers will be bright and red! The goat cheese is optional, and of course, if you are eating strictly Paleo, then do not add the cheese. But there’s something about the combination of beets and goat cheese… A bite that encapsulates those two flavors is just so right. Preheat oven to 400 degrees (F). Put on rubber gloves. Wash and peel beets, then chop beets into small cube like pieces. Place beets onto baking sheet. Drizzle olive oil, sea salt, and black pepper. Bake for 25 minutes. 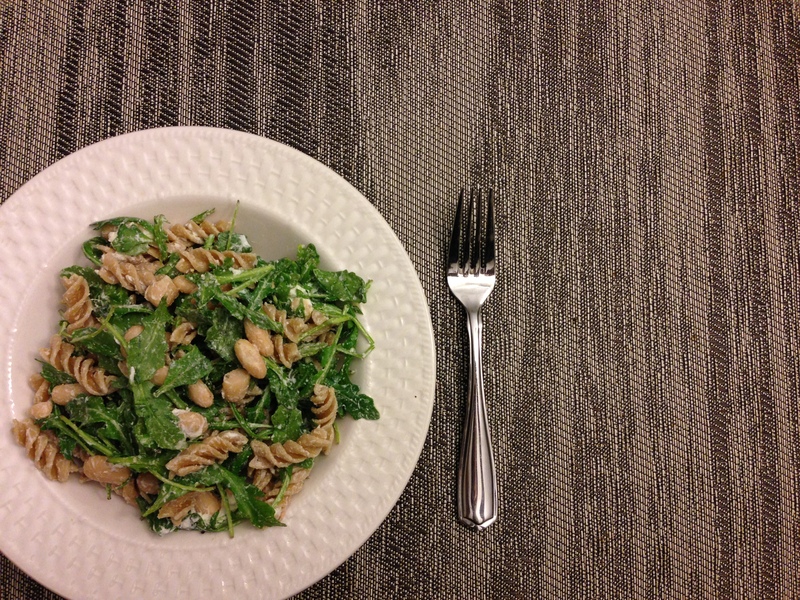 On your serving plate, spread a layer of arugula leaves. Add the beets, then pistachios. Top with goat cheese. EAT UP! No dressing needed!! What do I feel like making?